@CollegeGameday / TwitterThe city of Pullman has declared a state of emergency in anticipation of possibly 75,000 Washington State fans heading to check out the popular ESPN show. ESPN’s “College Gameday” is heading to Washington State for the first time this Saturday. 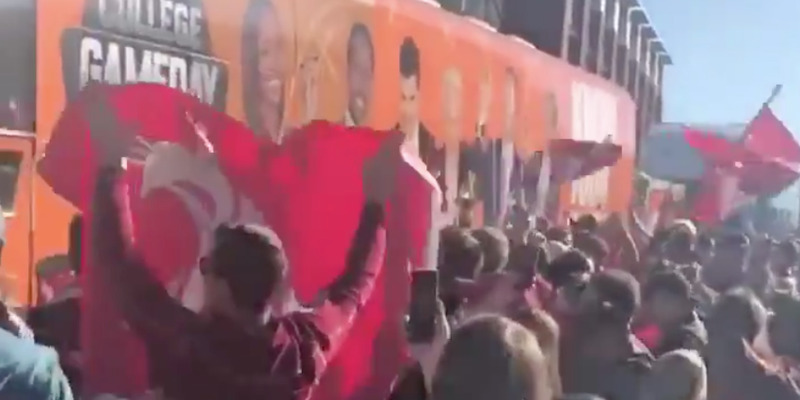 Cougar fans have been rallying to host “Gameday” for 15 years now, flying their flag Ol’ Crimson at every show in one of the most beloved traditions in college football. After the long wait, the arrival of “Gameday” is causing such a celebration in Pullman that the city has declared a state of emergency for Saturday. Every week ESPN’s “College Gameday” heads to the site of one of the biggest games in college football that Saturday to preview the day’s action. As Rece Davis, Kirk Herbstreit, Desmond Howard, and Lee Corso go through the best games on the slate, fans from the school hosting the show stand behind the desk, holding up signs, waving flags, and generally having a good time before starting their tailgate in full force. This Saturday, after 15 years of trying, “College Gameday” is finally heading to Pullman, Washington for the Washington State-Oregon game, and by the looks of things, it’s going to be a madhouse. Now THAT is a warm welcome, @WSUCougars! While Washington State might not be the first name that pops to mind when a casual fan imagines a football school, the Cougars have been a staple of “College Gameday” dating back to 2003, when WSU alum Tom Pounds flew the team’s flag Ol’ Crimson behind the “Gameday” set in Austin for a Kansas State-Texas game. Since then, the flag has flown on “Gameday” every Saturday, travelling from school to school as a charge of WSU alums across the country. In a sport filled with tradition, the flying of Ol’ Crimson is among the best. The waving of the flag began as a campaign to bring “Gameday” to Pullman, but over the years evolved into something more than that – it was simply a part of the show. But this Saturday is different. After 15 years, “Gameday” is finally heading to Pullman, and judging from the video above, you can expect things to get wild. The city has gone as far to declare a state of emergency in order to free up more buses to help move fans across campus on Saturday. Get ready for a party in Pullman.